This recipe is super easy to make. 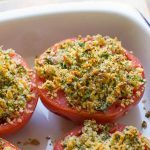 In just 20 minutes, you will have a flavor-packed tomato side dish. It's low carb and keto diet friendly. Slice tomatoes in half and place sliced side up in shallow baking pan. Drizzle the remaining ingredients on the tomatoes in the order listed. Place under broiler or in oven (400 degrees F) for just a few minutes, until cheese is golden.